Apple's iPhone 8 Plus takes on LG's G6 in our smartphone camera shootout. Let's look at color, clarity, exposure, and overall user experience. We put the LG G6 and Apple iPhone 8 Plus head to head in a smartphone camera showdown. 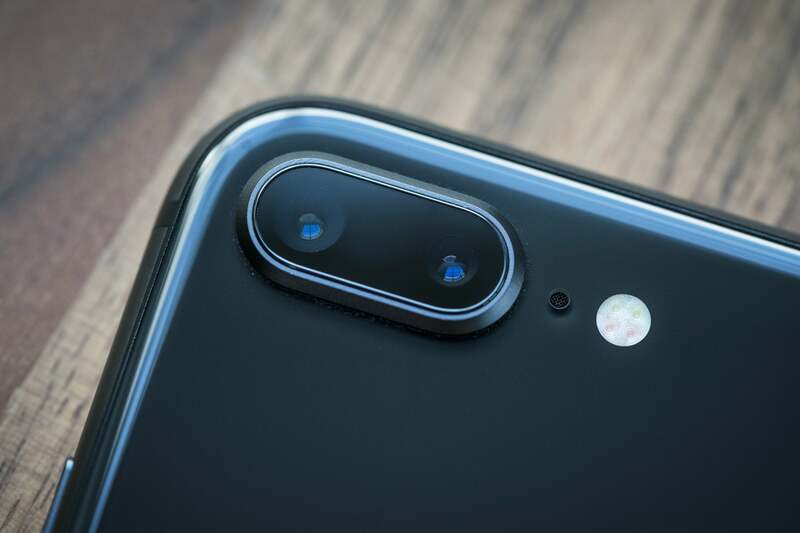 Last year, Apple failed to take the top spot in our four-way smartphone camera shootout between the iPhone 7 Plus, LG V20, Google Pixel XL, and Samsung Galaxy S7. But this year’s iPhone 8 Plus includes some major improvements over the iPhone 7 Plus, and looks perfectly positioned to take on the LG G6, our current pick for best smartphone camera. So which phone offers better camera performance—the latest iPhone or the G6? We took a ton of photos to find out. Oh, and in case you’re wondering where the Pixel 2 stands in this battle, just give us a few more days. We’re currently doing extra camera tests with Google’s amazing new phone, and will have definitive results soon. We put both the Lg G6 and iPhone 8 Plus head-to-head in a wide variety of testing environments. 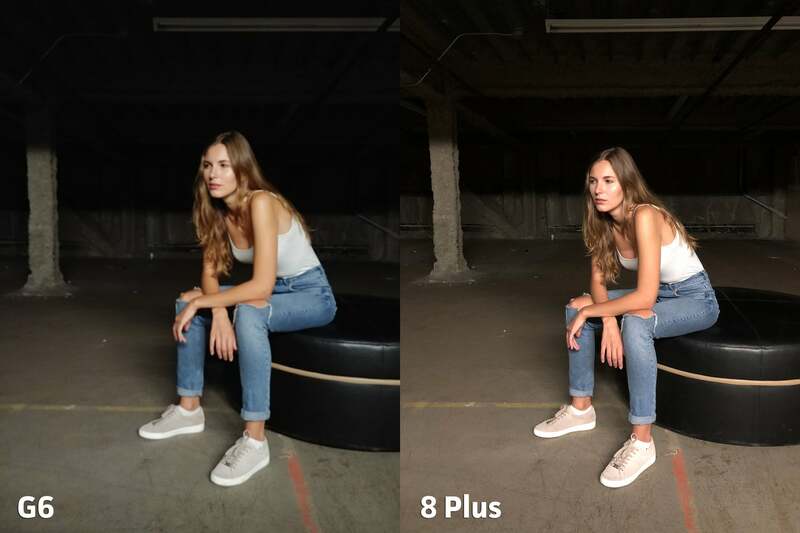 Apple’s iPhone cameras have been a bit stagnant in recent years, but the iPhone 8 Plus is turning that around with some huge changes under the hood. The sensor has been updated with “deeper” dual pixels, the lenses have new color filters, and Apple has switched to a proprietary image signal processor (ISP). The camera might not look too different from last years model, but the improvements made to the iPhone 8 Plus are major. The rest of the specs remain similar on paper. The dual-lens system features one normal lens and one telephoto, providing a 2x optical zoom. 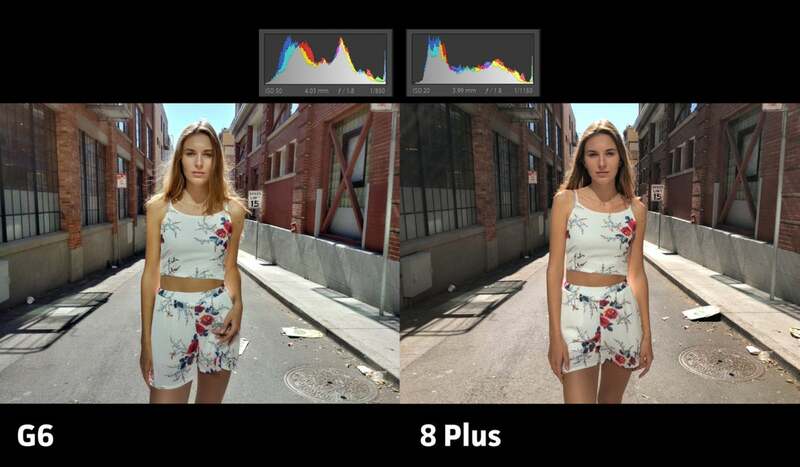 Both cameras have 12MP sensors, with the normal lens sporting an f/1.8 aperture and the telephoto lens stuck with a much lower f/2.8 aperture. Just like last year, Apple made the mistake of forgoing optical image stabilization (OIS) on the telephoto lens, including it only on the normal lens. LG’s G6 has been through many camera shootouts and emmerged victorious. LG’s G6 features better specs in its dual-lens system, and takes a different approach to its second camera. Most notably, LG pairs the G6’s normal lens with a super-wide-angle lens, allowing for more of a scene to be captured in a single frame. Both sensors are 13MP, with the normal lens rocking an f/1.8 aperture and the super-wide angle having an f/2.4 aperture. The G6 also has one of the best stock camera apps around, including a powerful and easy-to-use manual mode. 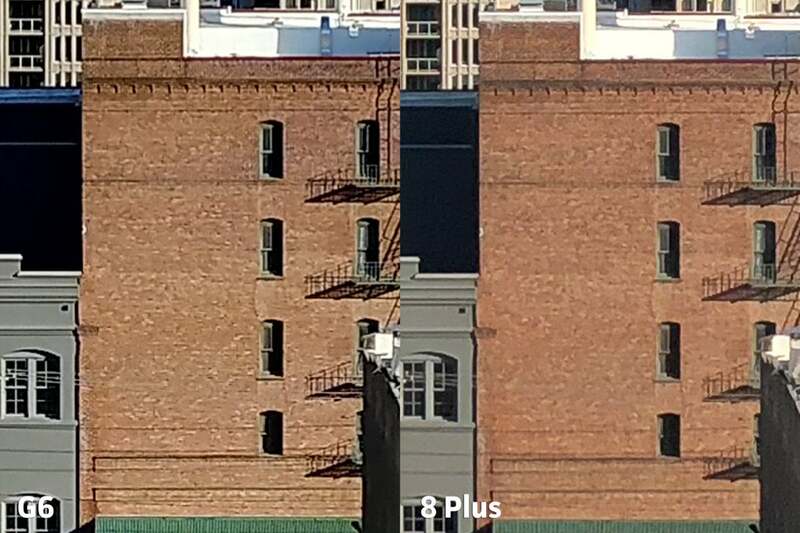 For this camera showdown, I’m going to focus mostly on the results from the main cameras for both phones. And I’ll use them the way most people do: straight out of the pocket, with the stock camera app, and HDR set to auto. Our testing categories are broken into four sections: color, clarity, exposure, and user experience. 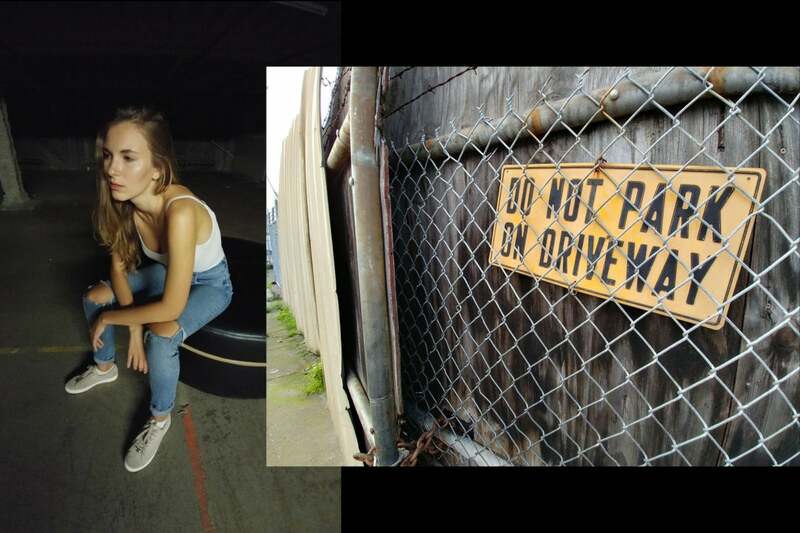 And for this shootout, we hired the beautiful model Valeria to help us with real-world testing. The first category we’re going to cover is color, and here I’m looking for accurate color balance, along with reproduction of natural skin tones. The iPhone is a bit warmer where the G6 is cooler, but colors are spot-on compared to the naked eye. Right off the bat, I can say that the iPhone 8 Plus and its new internals produce some of the most accurate color results I’ve seen in a smartphone camera. The new sensor and lens color filters are partially to thank, but the majority of this power comes from Apple’s new ISP. 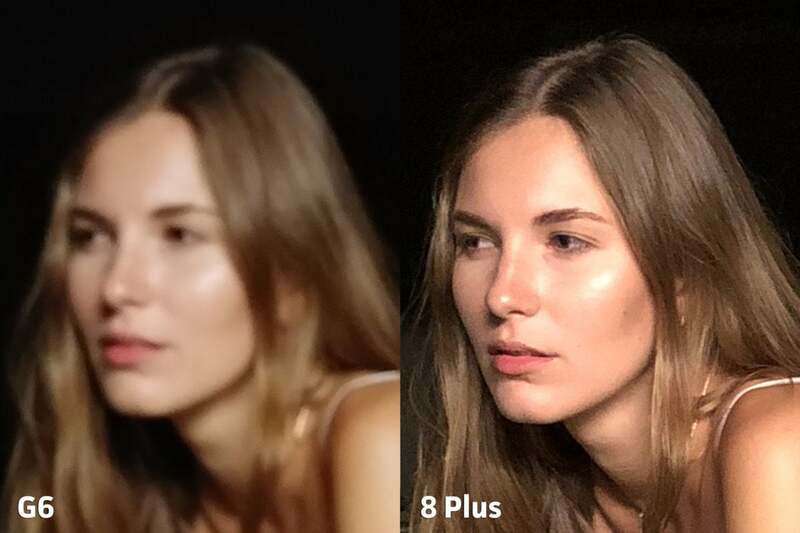 Apple really made skin tone reproduction a focus with the 8 Plus. The bluish hue of the G6 makes the concrete appear unnatural. 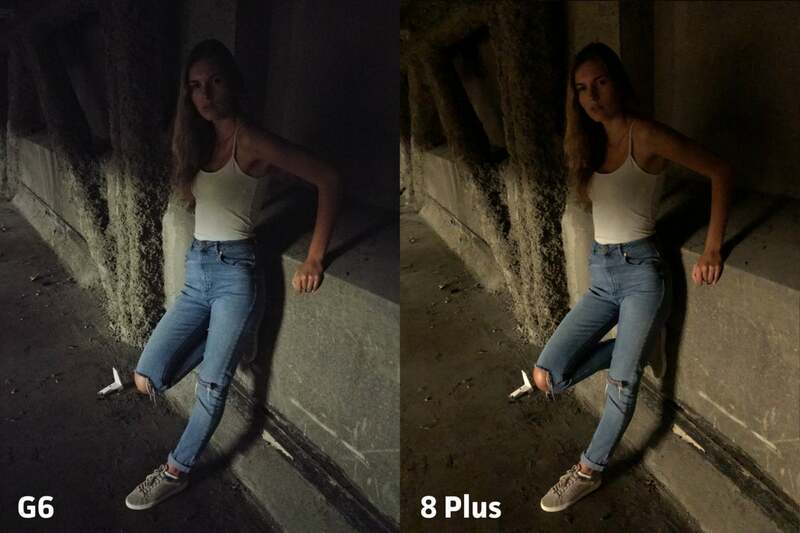 In low light, the bluish hue of the G6 negates the warm glow from the floresent bulbs, but has the effect of muting the skin tones. Against this brick wall, the iPhone is actually a bit cooler than the G6. The color on the flowers is a bit too punched-up on the 8 Plus, but the white balance is on point. Past iPhones have struggled in the color category, so it makes sense that Apple would put so much effort into correcting its faults. No matter what lighting scenario I threw at it, the 8 Plus performed more like a DSLR than a smartphone. The color battle is a blow-out for Apple, and easily goes to the iPhone 8 Plus. Next we’ll go over clarity, and these results are a bit more nuanced. Here I’m looking at the sharpness of each image, and how each camera decides to maintain a clear photo across multiple lighting scenarios. You’ll want to click on each image to see clarity flaws in detail. Both phones hold their own and retain plenty of detail. 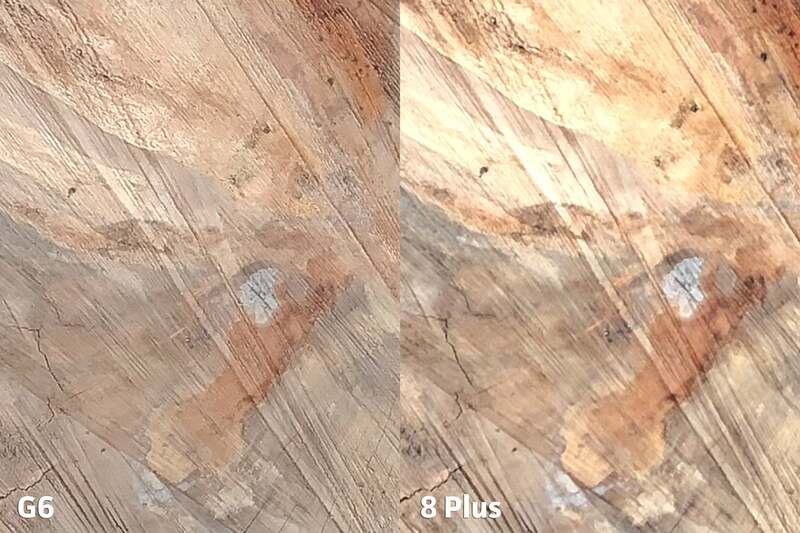 Zooming in reveals that the iPhone does produce a bit more detail compared to the G6. The LG G6 stands up quite well to the iPhone 8 Plus and even outperforms it in a few scenarios, like far distances and macro. But the 8 Plus has the upper hand at normal shooting distances, so it’s suited quite well for day-to-day use. A wide city shot looks fairly even. 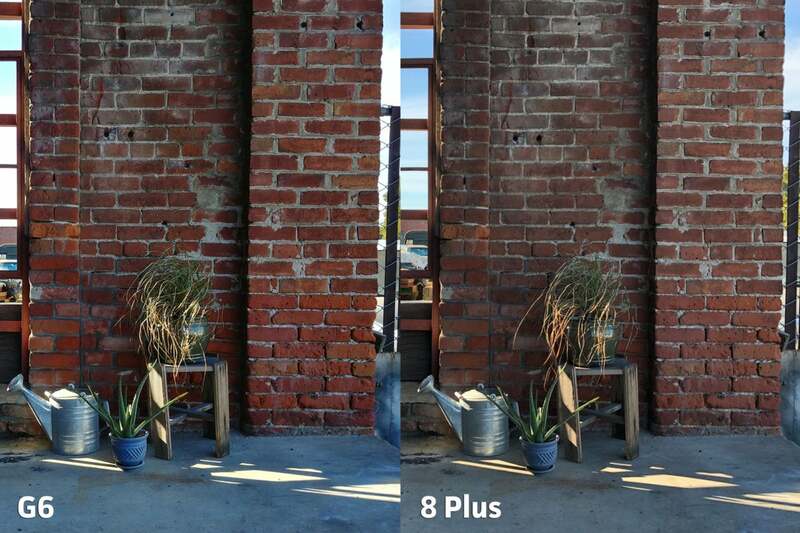 But punching in on the bricks shows how each camera deals with compression and noise reduction. The G6 is a tad cleaner. The iPhone has a great punch to it. But upon closer inspection, the G6 is clearly superior here. In normal shooting distances, the iPhone hits its sweet spot. 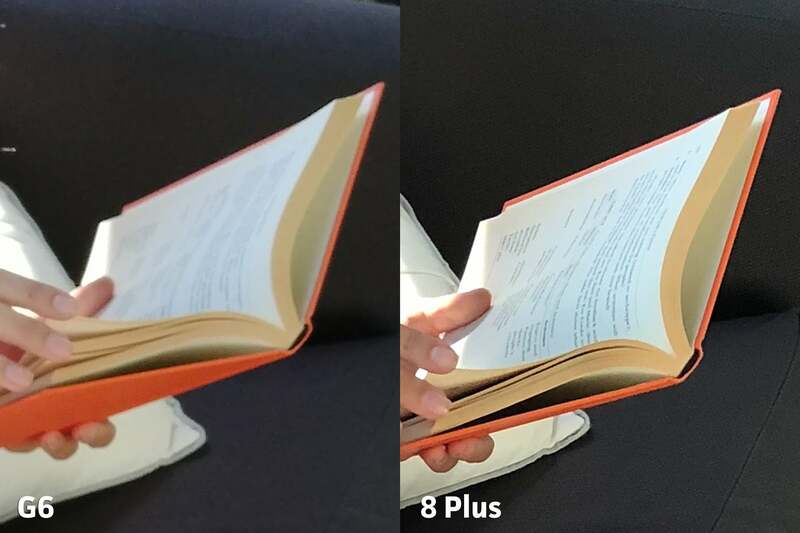 Zooming in shows a clear difference between the two books. In low light, both phones stumble in different ways. The G6 holds a bit more dynamic range in the darkest of areas and has a very aggressive OIS system that helps maintain detail. But the 8 Plus has a more pleasing grain structure and super-quick autofocus. In this superlow-light shot, neither photo is great. And zooming in shows a bit more insight into the grain structure between the two. 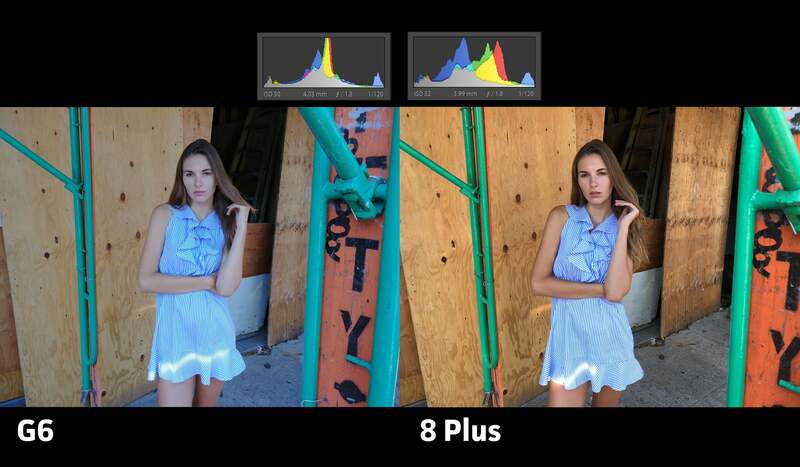 Autofocus performance makes a huge difference, especially in low-light situations. Not only was the G6 slower to focus, in this shot it missed focus all together. In fact, I was stunned by the speed and accuracy of the iPhone’s autofocus system. That’s enough to give the iPhone 8 Plus the edge, and take the clarity category. 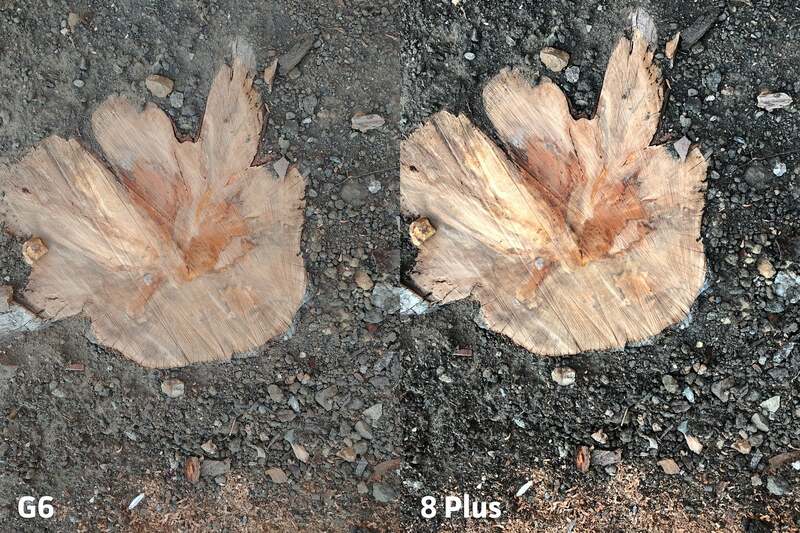 For our exposure test results, I’m going over the dynamic range capabilities of each phone, and how they chose to expose for the scene. I’ll include a histogram in each shot so you can check out the graphs for yourself. 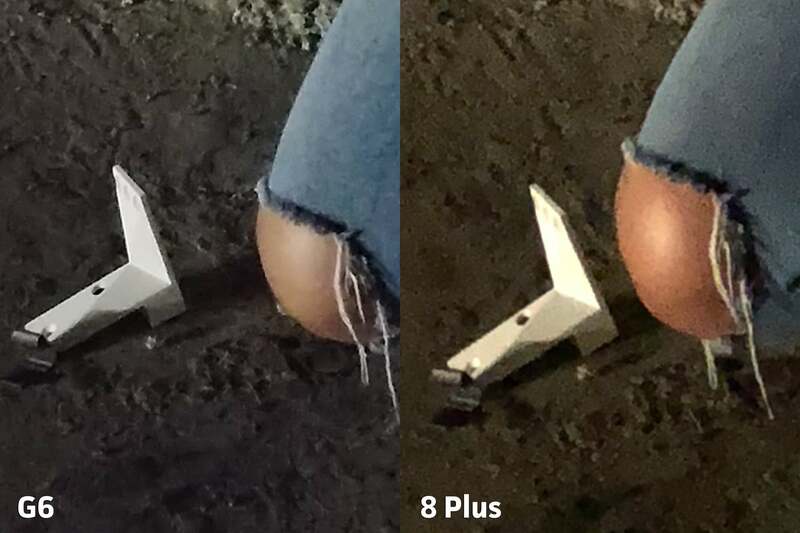 Both phones handle exposure very well, but fall down in some specific ways. The G6 chose to overexpose this street scene compared to the iPhone, but both blew out the sky. The exposure category was a tight race, with both phones handling themselves very well in almost every lighting condition. 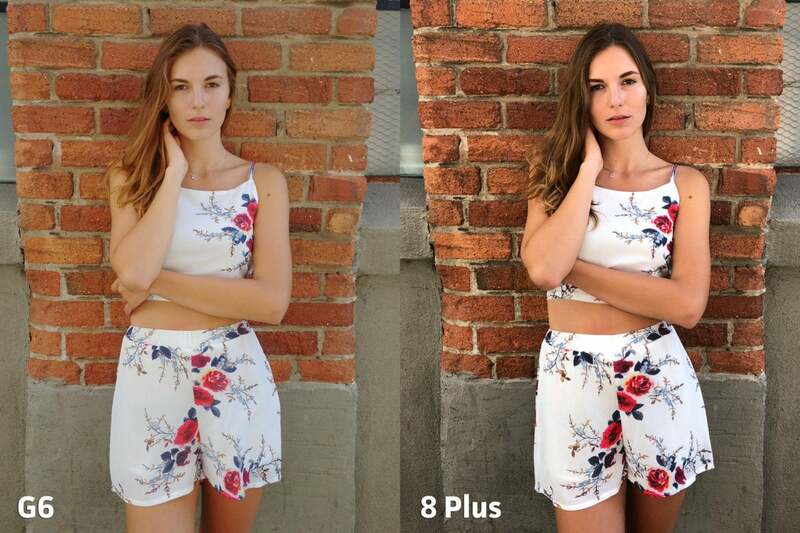 The G6 has a flatter image, making the photos look washed-out when compared to the iPhone. But that’s not necessarily a bad thing. Having a flatter image allows for more flexibility in editing, and guards against bad exposure decisions. 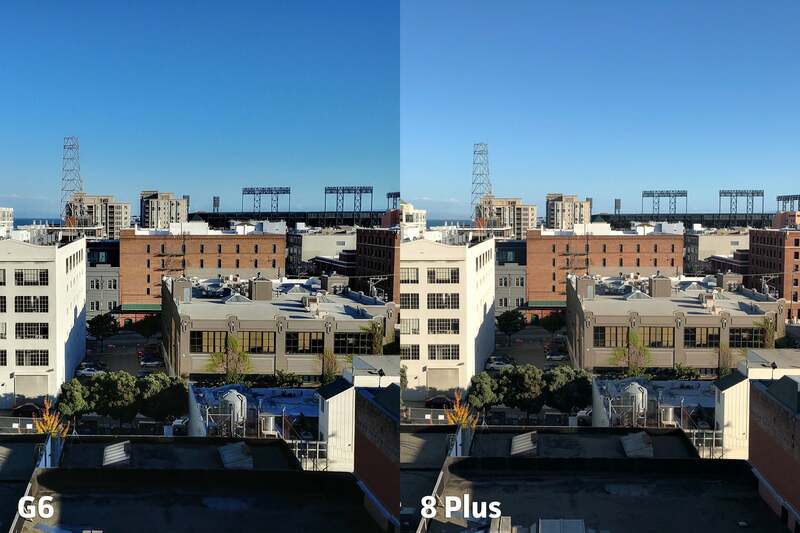 The G6’s photo looks washed-out compared to the 8 Plus, but the exposure is accurate and keeps from clipping. 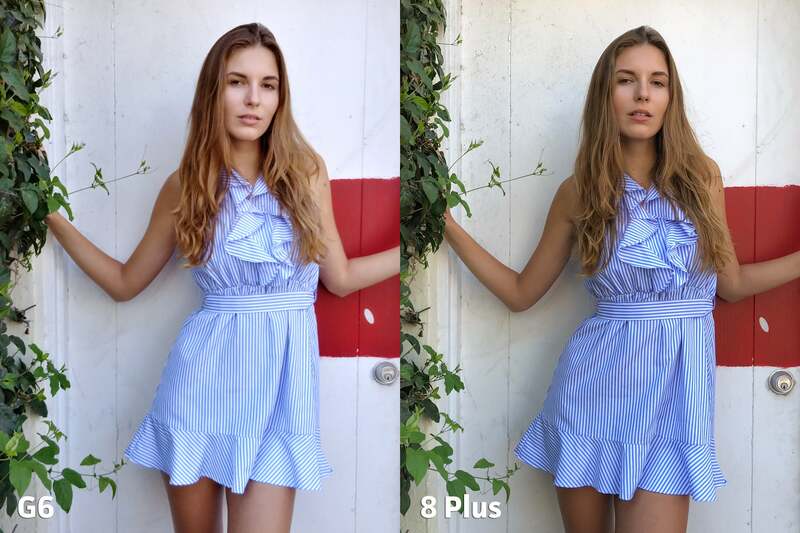 Most of the contrast can be added back into the image using even the most basic tools found in Instagram. Both shots are accurate and have their advantages. The iPhone is just more aggressive in adding pop to the image. 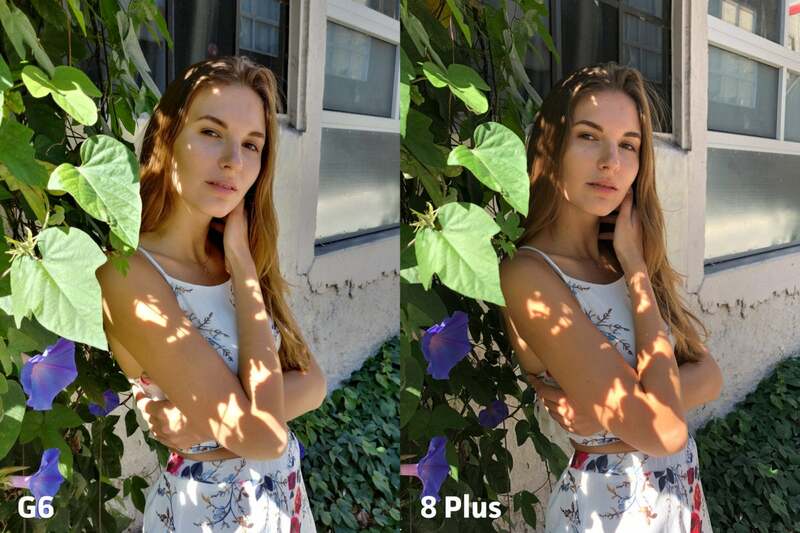 Nonetheless, almost all of the exposure decisions the 8 Plus makes are spot-on. Basically, the iPhone maintains accuracy while retaining a nice punch, right out of the camera, with no editing. So it really comes down to personal preference on how you like your phone to handle processing. I support both approaches. The G6 goes for less showy results, but leaves open the door for more editing flexibility. 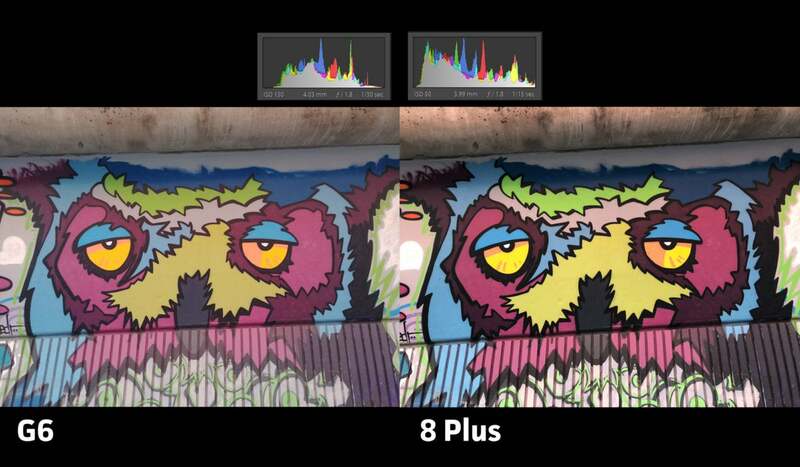 The iPhone has more wow factor, but doesn’t make bad exposure decisions. So I’m calling the exposure category a tie. The last category to hit is user experience. Because even if the camera is amazing, it’s not worth using if the experience is horrible. The G6 has great advantages, like the ability to quickly launch the camera app with a double-press to the volume key. I also believe LG has the best stock camera app you could ever want on a smartphone. For instance, you get a manual mode with a histogram, RAW photo support, and some really cool modes that leverage the G6’s dual camera system. The iPhone, on the other hand, is snappy, straightforward, and easy to use. I never second-guessed the 8 Plus’s ability to accurately pull focus, even in low light. The biggest difference between using both phones are their second cameras. The iPhone uses a telephoto lens that gives you an effective 2x zoom, which is good for capturing far-off subjects. But Apple’s Portrait Mode offers even more value from the telephoto lens. 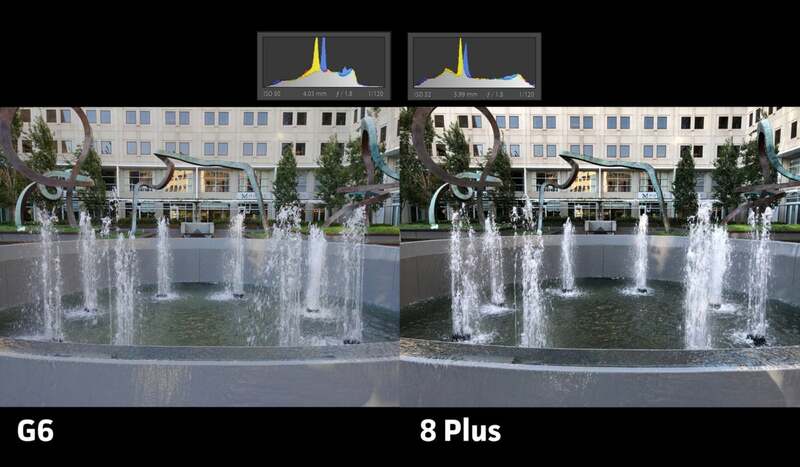 It uses the two-lens system to gather depth information, and introduces blur into the scene, providing stunning results. Despite the shortcomings of the technology, Portrait Mode on the iPhone 8 Plus continues to impress. On the LG side, we have a second lens with a super-wide field of view, allowing more of a scene to fit into the shot. As awesome as Portrait Mode is—especially when shooting with a model—I just found myself having way more need for a super-wide lens during day-to-day use. I personally found way more uses for the wide-angle lens on the LG G6. These features really boil down to personal preference. I’m only going to give the slight edge to the LG G6 in this category, mainly on the strength of its camera app features—you can just simply do more with LG’s camera. So after four categories we have a clear winner: Apple’s iPhone 8 Plus! 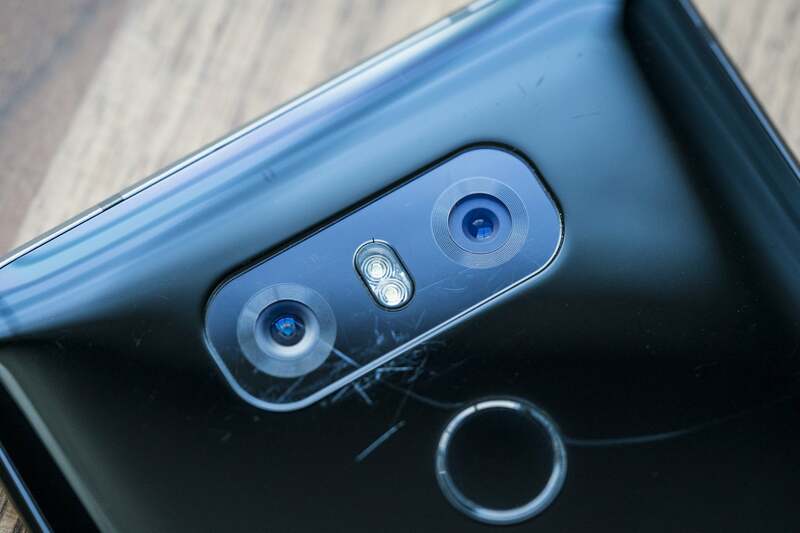 The G6 beat some awesome phone cameras this year, and it’s been a great ride for LG. But after a couple of lackluster years, Apple finally stepped up to the plate and created a truly stunning camera system. Photos shot with the iPhone 8 Plus have the most accurate colors I’ve seen from a smartphone camera. The accuracy approaches DSLR levels, even in low light. I believe the strength of this new system lies within the new ISP. If this phone is any indication, we should see even better results coming from Apple’s upcoming iPhone X. So there you have it, a new champion among smartphone cameras! But this year isn’t over yet, and both Google and LG have brand-new shooters to test. We’ll put them through the paces—our Pixel 2 test results are just around the corner.